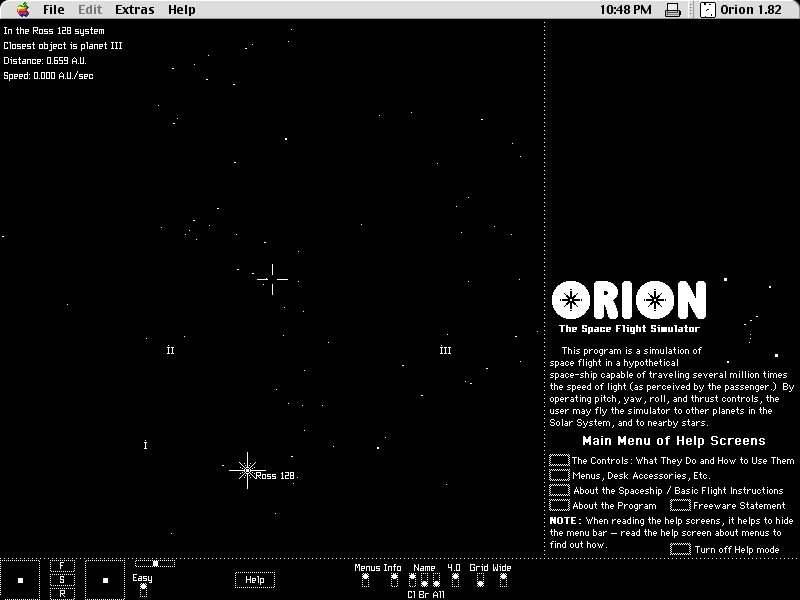 Orion was a flight simulator I created for the original 128K Macintosh in 1985. In order to get reasonable speed, the entire thing was written in assembly language, including most of the graphics1. 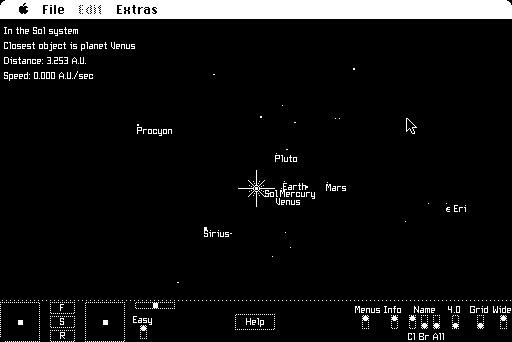 Across the bottom are flight controls and toggles to enable display of various features, such as names of stars and stars that would normally be too dim to see. You could also hide the menubar (going to true "full-screen mode") to make the experience a little more immersive. 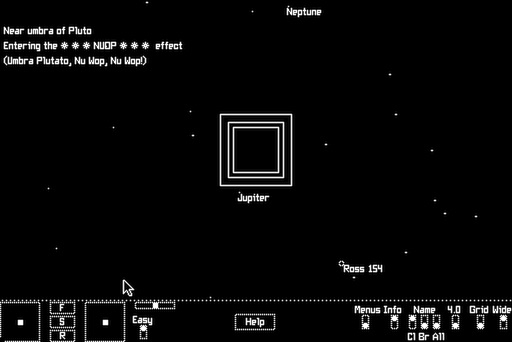 The program enabled orbiting planets, but substantial knowledge of orbital mechanics was needed because the program did not provide any automatic navigation functions. However, gravity was normally turned off, making the ship automatically "follow" the nearest object whenever you hit the Stop control button. 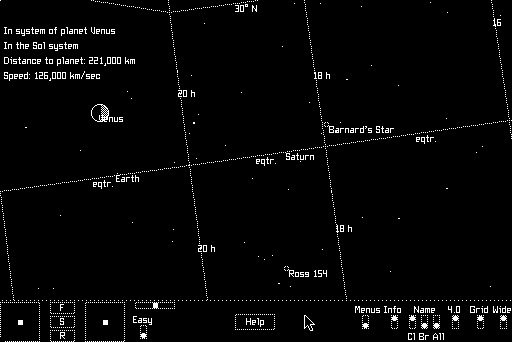 This image also shows the nearby star Ross 128 and an imaginary system of planets. All of the stars in Orion are real, including all stars within 10 parsecs of the Sun (that were known in the early 1980s). The help screens were integrated, so you could view the help pages and use the flight controls simultaneously. The little gray rectangles are hyperlinks going to other pages of the built-in help. Here is a binary: Orion 1.82.bin. This is the Sep 3 1988 version, which should work on all versions of the "Classic" MacOS for 68K or PowerPC processors. It does not work in the "Classic environment" of MacOS X but runs fine in the Mini vMac, Basilisk II and SheepShaver emulators. 1 : I wrote my own fillrect, plot single pixel, draw line (and dotted lines), fonts, and bitmap copy to screen; a few things like polygon fill for planet phases is still QuickDraw. 2 : The phrase "Umbra Plutato, Nu Wop, Nu Wop!" was a Dartmouth inside joke referring to "Data potato du wop du wop! ", an error message displayed by the "Avatar" smart terminal (used mainly for word-processing, but a stand-alone microcomputer in its own right.) The "Data potato" phrase was a quote from a full-page cartoon by James Stevenson in the New Yorker magazine (1979 August 20, page 29).